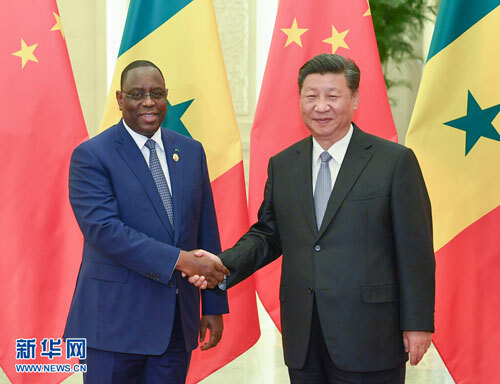 BEIJING, Sept. 2,Chinese President Xi Jinping met with his Senegalese counterpart Macky Sall on Sunday ahead of the 2018 Beijing Summit of the Forum on China-Africa Cooperation (FOCAC). Xi said he paid a very successful state visit to Senegal in July and felt the profound friendship that the Senegalese people hold toward the Chinese people. The two leaders witnessed the signing of the first cooperative document between China and a West African country on jointly building the Belt and Road and agreed on further cooperation on infrastructure and industrial parks. 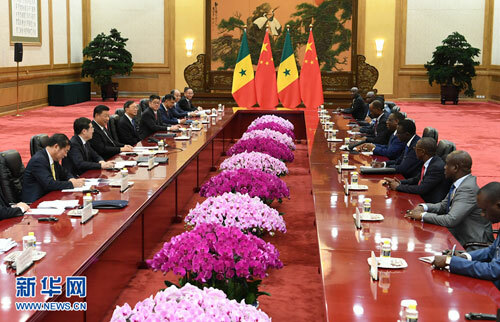 Xi said the two sides should continue close communication and push for greater development in China-Senegal relations. To build a stronger China-Africa community with a shared future is significant to achieving common development, strengthening solidarity and cooperation of developing countries, and building a community with a shared future for humanity, Xi said. China supports the self-reliant and sustainable development of Africa, and is ready to work with African countries including Senegal to maintain and develop the FOCAC mechanism, Xi said, eyeing greater contribution to the comprehensive strategic and cooperative partnership between China and Africa. Sall said Xi's historic visit was warmly welcomed by Senegalese people and Senegal admires China's development achievements and its important role in international affairs. China firmly pursues the development path suited to its own national conditions, which African countries can use for reference, Sall said. African countries have suffered in history, and it was China that firmly stood by the side of African people when they struggled for independence and liberation, Sall said, adding that China always understands, respects and supports Africa. In the new era, Africa needs investment and development, Sall said. Sall said African countries will stay unaffected by noises against Africa-China cooperation and work with China to consistently support and help each other, jointly build the Belt and Road, and strive for a stronger Africa-China community with a shared future.